FROM DOWNTOWN: Head west on Sixth Street past Lamar Blvd. Take a right at the light on West Lynn and head north about four blocks. 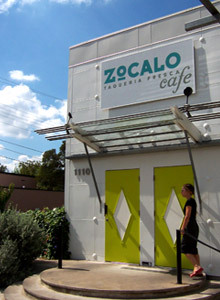 Zocalo Cafe will be on your left across the street from Nau’s Enfield Drug Store. FROM MOPAC: Exit Enfield and head East of Mopac. Take a right at the light on West Lynn and head South about four blocks. Zocalo Cafe will be on your right across the street from Nau’s Enfield Drug Store.